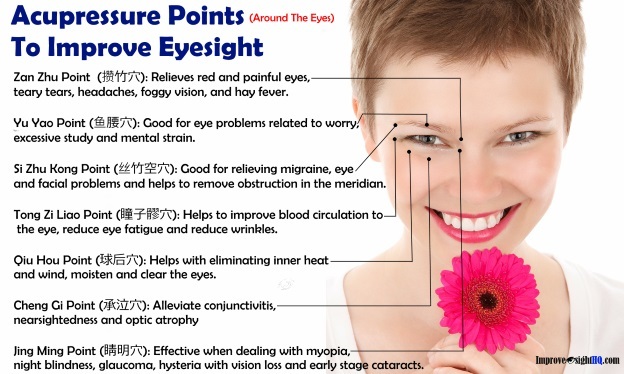 Acupressure For Eyes: 17 Acupressure Points To Improve Eyesight Now! Having eye problems? Acupressure for eyes may be able to help. Nowadays, everyone is walking around with a smartphone/tablet or have jobs that involves long hours of computer work. But prolonged periods of staring at smartphones and computers have a devastating effect on our eyesight. Symptoms such blurry vision, dry eye, eye strain, fatigue, headache and double vision are common among heavy users. While the best solution maybe to minimize their usage, it is usually not feasible as these devices have become a huge part of our life. We use them for entertainment, work, social connection and even learning. It is even more so for youngsters. Try asking children/teenagers to stop spending so much time on their smartphone and they will probably think that you need to start taking your medications. 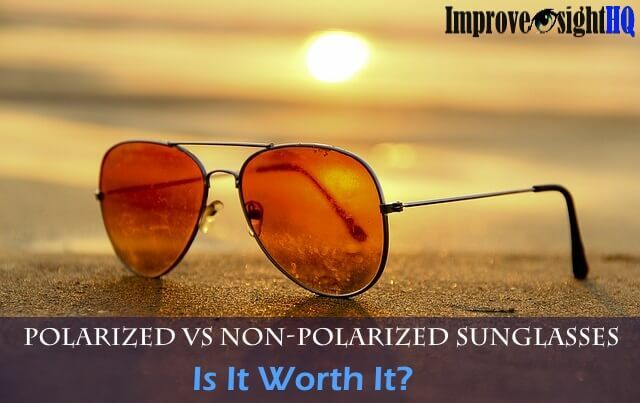 While using blue light filters may help with the glaring and melatonin production, it does not help with the strain and dryness which comes with long hours staring at the screens. This is where acupressure for eyes comes in. 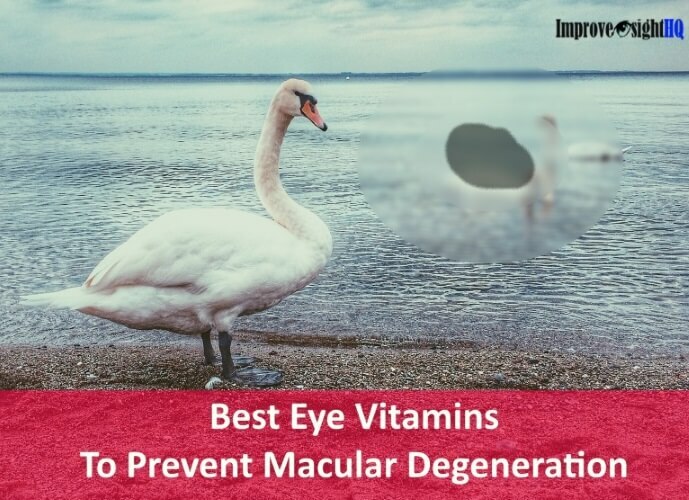 It helps to relieve strain, improve eyesight, combat dry eyes, easy to learn, effective and most importantly it can be done anywhere and anytime; with or without assistance. Acupressure, also know as Chinese Massage or Tui Na (推拿), is an ancient self-help healing technique that involves pressing specific acupoints on your body to stimulate the body’s self-curative capability. It is similar to shiatsu, the Japanese version of acupressure, and has been used in Traditional Chinese Medicine for more than 5000 of years. It is a less ‘intrusive’ version of acupuncture which uses the same methodology and involves sterilized needles in its treatment. Chinese acupuncturists has been using acupuncture to treat conditions such as nearsightedness and other refractive errors, excessive tearing, eyelid twitching sinusitis and strabismus for many years. However, It is beyond my knowledge to teach you how to use the needles without hurting yourself/others and not looking like a hedgehog. In fact, I strongly advise against trying acupuncture at home as it is not safe and it will hurt like hell when administered wrongly. In this article, we will focus on acupressure which is less technical, safer and zero cost. Most importantly, you can do it yourself without any help from others. Subscribers of the acupuncture and acupressure methodology, believe that our body is made up of an invisible systems of meridians or pathways. These meridians extend from the tip of our toes/fingers to our head and connect all of our major organs together, creating a network of communication throughout the body. When one is healthy, energy (Qi - 气) should flow effortlessly along these pathways, supplying vitality and, when necessary, healing. However, several factors such as poor nutrition, physical trauma and stress, can cause blockage to be formed along the meridians. Dis-ease occurs as the energy is unable to flow and one may experience pain, illness and dysfunction of the body part. 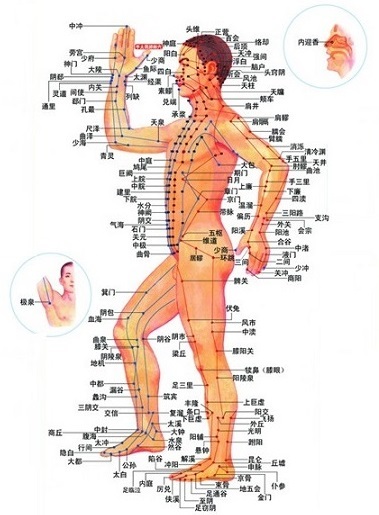 For remedy, practitioners of acupressure and acupuncture will pinpoint the blocked area and locate the acupoint - 穴道 (also known as acupressure point) that correlate to the respective organs where the dis-ease lies. For example, to treat tension in the head, certain acupoints of the hands has to be attended as a meridian connects them. By putting pressure or applying needles via the acupoint, tension is released and energy flow is restored. Once the energy is restored, the body’s life force will kick in and aid healing. There are no scientific consensus over the efficacy of acupressure. Some believe that it is simply a matter of placebo effect. However, although some Western doctors do not believe in qi and the channels, they do believe that the results obtained from acupressure are due to reduced muscle tension, improved circulation and endorphin stimulation. There are also several research which state that acupressure can help with back pain, reduce fatigue, remove headaches, lowering high blood pressure and treating brain trauma. It has found effective even in areas where the only treatments available for similar symptoms in Western medicine are medication or surgery. For instance, a group of scientists found that auricular acupressure is useful in improve visual acuity in patients with glaucoma. In nutshell, while not proven scientifically, there are evidences of acupressure’s effectiveness. If you have doubt, the best way is to try it out yourself and see the effects. It is free and there are no reported side effects. Personally, I find doing acupressure regularly keep my eyes crisp and relax after a long day of computer work. Firstly, it is not supposed to hurt. Concentrate while doing acupressure and make sure positions are accurate. To administer treatment to an acupressure point, simply apply firm but gentle pressure to the acupoint with your finger or thumb. The idea behind acupressure is to stimulate the point, but not to cause the muscles to tighten from pain. You can either apply threshold pressure to a point for ten seconds, then release for ten seconds. Repeat the pressure-release cycle eight times. Or massage them in small circular motions. Personally, I prefer this method as it gives a sensation that the muscles are relaxing around the acupressure point. In TCM, there are more than 400 acupoints on the body. Here, I will share with you ones which i uses daily for eyesight improvement. Below are several acupressure points which you can use to improve your eyesight and reduce eyestrain. If you have a serious illness, or life-threatening illness such as heart disease, or cancer, please consult with your physician before practicing acupressure. When applying pressure on the acupressure points near the eyes, do not press on the eyeball. Stop doing acupressure if you have pink eye, skins tear around the eye or having virus infection. Wash your hands first before doing acupressure to avoid having dirty things in your eyes or face. We won’t want pink eye or you growing pimples. It is recommended to drink water (preferably warm) after finishing your acupressure routine. It will help to wash away the toxins released from the body. There are 3 helpful acupressure points along your eyebrow and 4 below your eyes. Zan Zhu Point (攒竹穴) - Lies in the depressions at the inner ends of the eyebrows. Relieves red and painful eyes, teary tears, headaches, foggy vision, and hay fever. Yu Yao Point (鱼腰穴）- Midpoint of the eyebrow in the hollow. 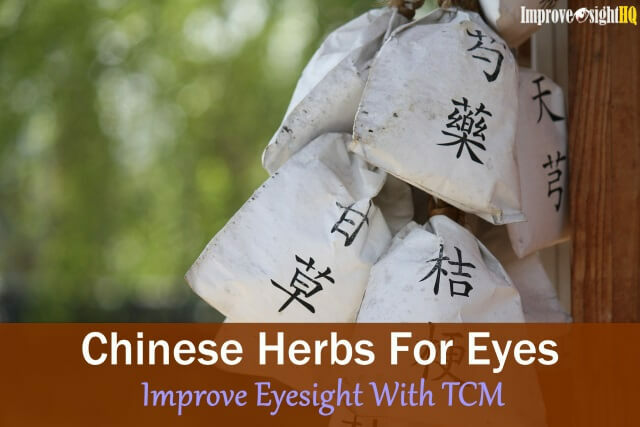 Good for eye problems related to worry, excessive study and mental strain. Si Zhu Kong Point (丝竹空穴) - Lies in the depression at the outside end of the eyebrow. This is a local point good for eye and facial problems and helps to remove obstruction in the meridian. Tong Zi Liao Point (瞳子髎穴) - Outer corner of the eye socket. Helps to improve blood circulation to the eye, reduce eye fatigue and reduce wrinkles. Jing Ming Point (睛明穴) - Lies where the inner corner of the eye meets the nose. 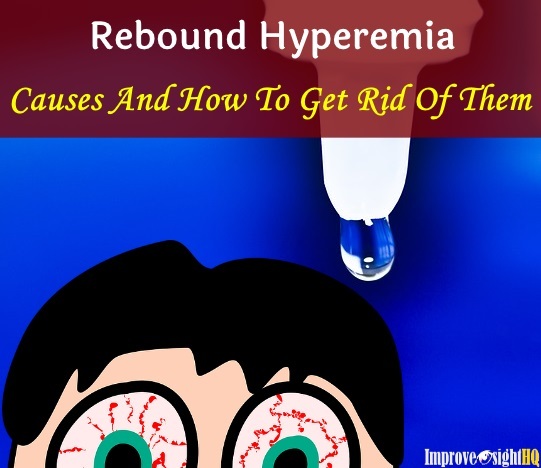 It is helpful when dealing with glaucoma, hysteria with vision loss and early stage cataracts. Using the outsides of your index and middle fingers, rub along the bony ridges above your eyes 8 times and do the same for the area below your eyes. Begin from inner to the outer side of the eye. Keep your other fingers curled under, and anchor your thumbs on each side of your cheek. There are other 6 important acupoints on our face for crisper vision. 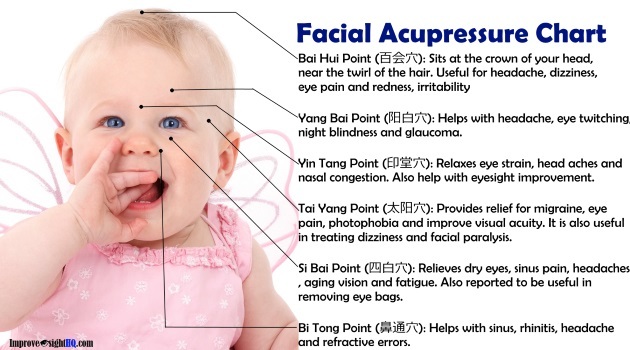 Let’s look at the facial acupressure chart below. Yin Tang (印堂穴）- Located in the middle of your eyebrows, right on the bridge of your nose. This point will help to relax eye strain, head aches and nasal congestion. 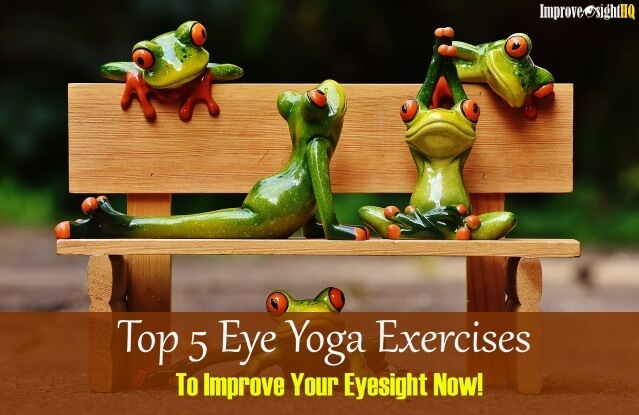 It completely relaxes the nervous system by improving emotional stress and helps in improving eye sight. Yang Bai Point (阳白穴）- Located on the forehead, directly above the center of your eyebrows. Helps with headache, eye twitching, night blindness and glaucoma. Tai Yang Point (太阳穴) - Positioned at your temple. You can locate it at the depression about 1 cm from the outer end of your eyebrow. Helps with migraine, eye pain, photophobia and improve visual acuity. It is also useful in treating dizziness and facial paralysis. Si Bai Point (四白穴) - Press the forefingers and middle fingers of each hand together. Then place the pairs of fingers on your cheeks next to your nose near the nostrils. This point is located in the depression at the infraorbital foramen. Relieves dry eyes, sinus pain, headaches, aging vision and fatigue. Also reported to be useful in removing eye bags. Bi Tong Point (鼻通穴) - Lies on the either sides of your nostrils. Helps with sinus, rhinitis, headache and refractive errors. Apply pressure on both points concurrently with two fingers. He Gu Point (合谷穴) - Also known as hoku point. On the hand which you wish to massage, move the thumb towards the index finger. Notice the hump formed from your palm muscle. 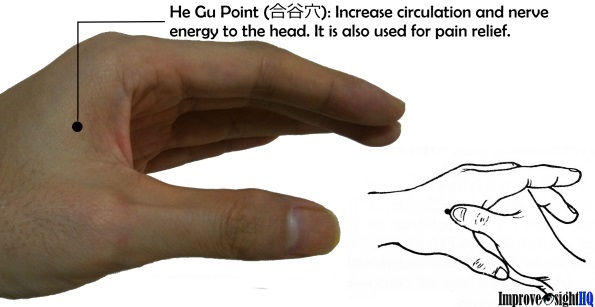 He Gu point is located at the peak of the hump. Massaging the hoku point is believed to increase circulation and nerve energy to the head. It is also used for pain relief. Use the thumb of the other hand, press and hold the point for 10 seconds while relaxing other muscles in the hand. Repeat cycle for 8 times. 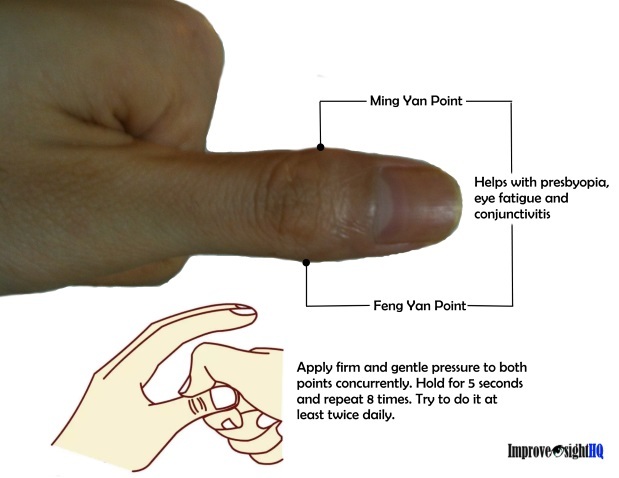 Ming Yan Point (明眼穴) & Feng Yan Point (凤眼穴) - Located at the left and right side of your thumb knuckle. Both points help with presbyopia, eye fatigue and eye infection. Grab the thumb on the both side with your other thumb and index finger. Apply gentle pressure and hold for 10 seconds and released. Repeat cycle for 8 times. There are two main arteries which pass through our neck to our eyes. The vertebral artery brings blood to our retina and carotid artery supplies blood to our eyes. When the neck muscles are tensed up, the pressure on the vertebrae, nerves and blood vessels causes reduced blood and signal flow to our brain, eyes, eye muscles, optic nerve and retina. Over time, this will result in our eye health being compromised and blurry vision. Therefore, it is important to massage your neck regularly to prevent neck muscle tension and vertebrae misalignment. Some of us have difficulty turning our head fully to the sides. You can try by turning your head and see if you can reach your shoulder with you chin on both sides. Inability signifies that certain muscles of our neck is too stiff to allow full range of movement. Such tension can also cause headache and vision problems. Hold it there and place your right hand behind your neck with your fingers closing towards your left ear. Turn your head slowly to the right while pulling your right hand back simultaneously. Repeat 5 times and do the same for the other side. There is another important acupoint point behind our neck. Yan Dian Point (眼点穴) - Situated at the back of your neck, at the depression directly below your skull and behind the ears. Pressing this acupoint, helps to relax the neck, head and eye muscles. Helps with aging vision, twitching eyelids and strained neck. Use both thumbs to massage the acupoints at the same time. With the other 8 fingers as support on your head, massage in small circular motion. Careful not to apply pressure on the vertebrae. It is highly recommended that you completes your acupressure session with palming for further eye muscles relaxation. Imagine staring into the darkness through your palm. Like exercising (and all good things in life), acupressure will only be effective if you do them regularly. Massage the acupressure points at least once per day. Personally, I do them after a long day at work, during my transmission to home. For optimal result, try combining it with Chinese herbs therapy. Drinking chrysanthemum with goji berries at the end of acupressure session can help clear inner heat and improve vision. Hope that these 17 acupressure points to improve eyesight will assist you on your journey to better vision.